Contact pages are an essential part of almost any website. The relationship with your clients/customers, receiving feedback, customer support and other forms of online communication can be facilitated by a well-coded contact form. Of course, it is possible to simply mention your email address on your contact page, but this may be an inconvenient sometimes, as scrapers can easily gather your email address and you will soon be flooded with spam emails. An HTML & CSS contact form protects you from this, thus preventing a significant number of spam emails from reaching your inbox. There are many tools you can use in order to add a sleek custom form on your contact page. For WordPress, there are WordPress plugins you can use, and other CMS systems may offer similar tools, however, if you have some coding knowledge, you can easily use one of these free HTML & CSS contact form templates. 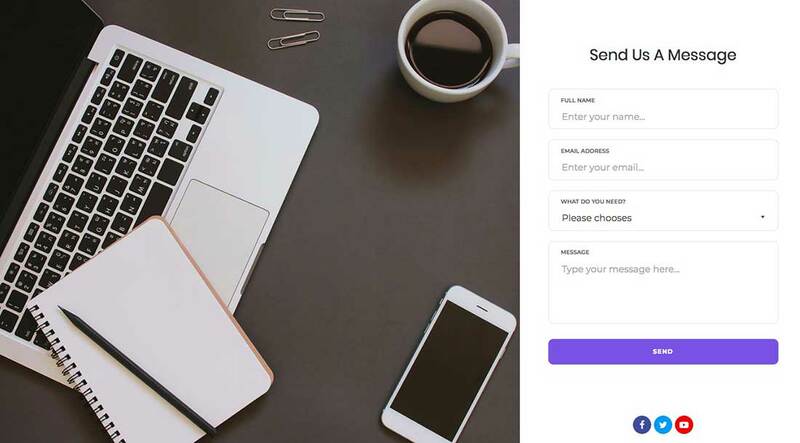 These uniquely designed custom form templates will make your contact page stand out! Some of them even have additional features, such as maps! 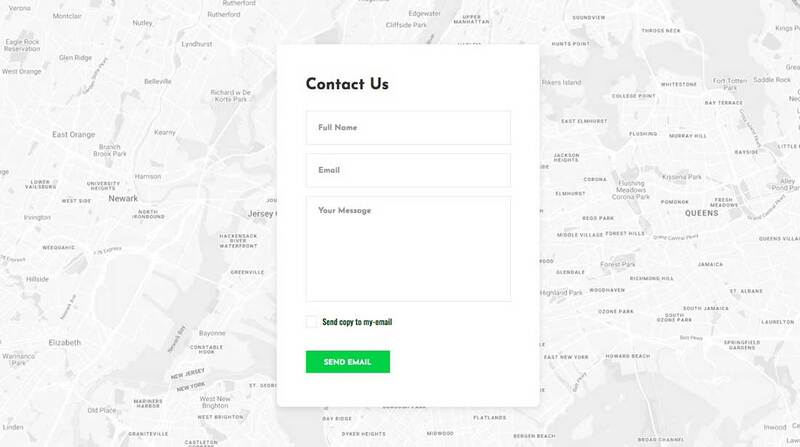 Check out the free HTML & CSS contact form templates below and choose your favorite! 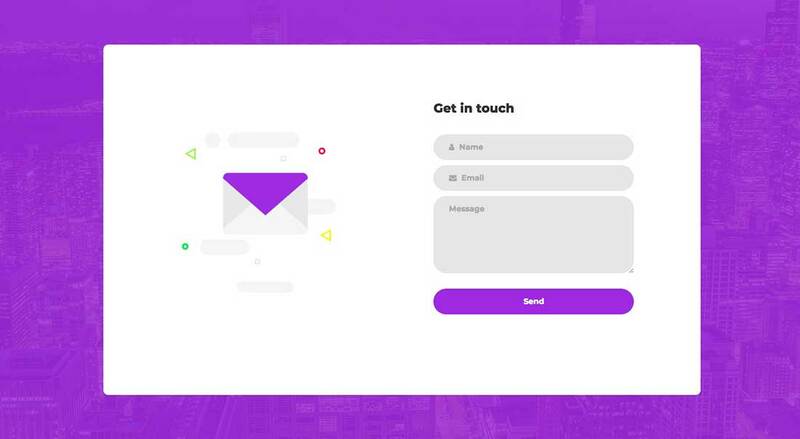 Contact Form 1 is a modern and interactive contact form template with mail icons that move along with your cursor and other cool visual effects. 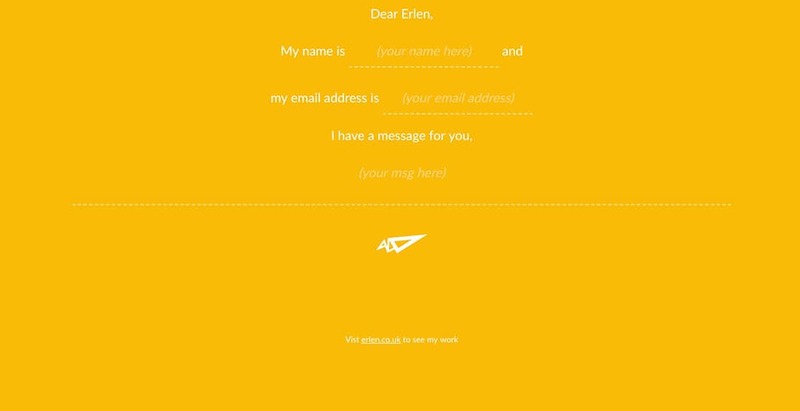 This type of contact form is perfect for interactive websites. It also has field validation and it’s completely responsive. Contact Form 2 has some lovely colorful accents. This is a full-width form template with subtle animation effects. 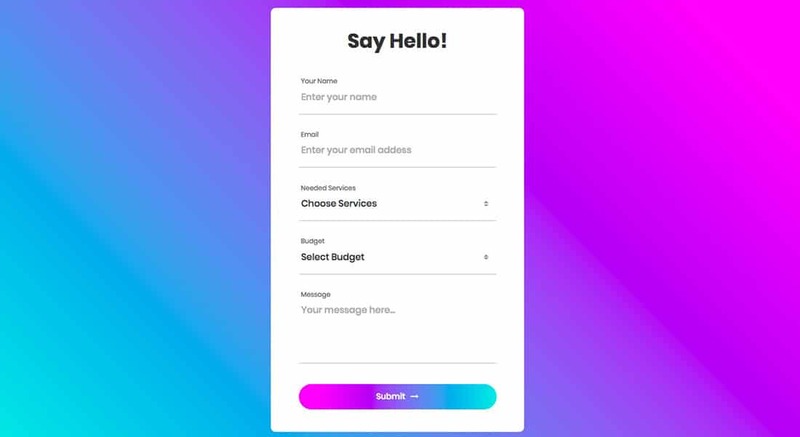 The button is in a colorful gradient that changes once you hover it and can be easily modified by you to fit your website’s color palette. Contact Form 3 is another cool contact form template that’s extremely versatile. It has an interesting new feature added, a dual option for your message, so the user can either use it as a contact form or as an inquiry form. It also comes with a photo background and a bright green color. These can be easily customized. 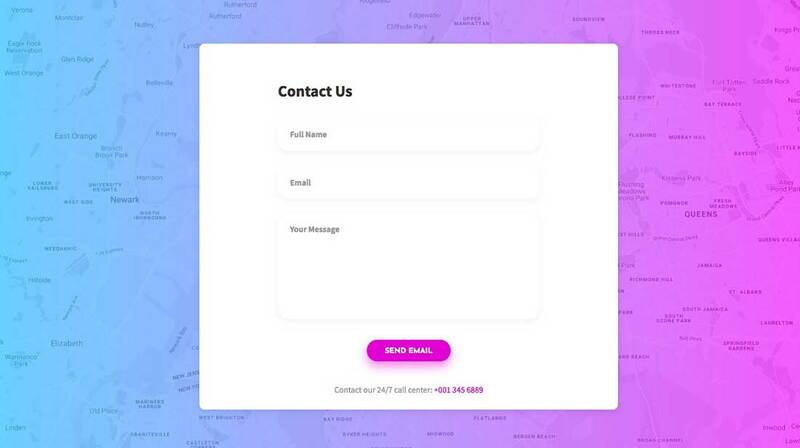 This contact form is similar to the one presented above, but unlike that one, it has a neon-colored gradient in the background and a simple, white color for the main elements of the form. This well-coded contact form supports field validation and is easy to integrate into any platform you use. 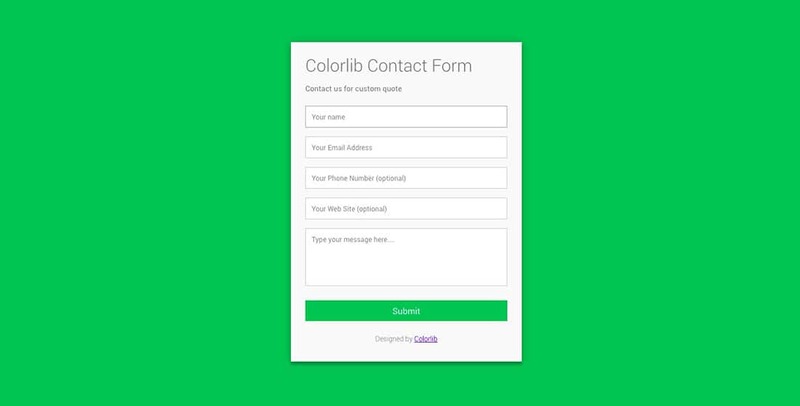 Colorlib Contact form is a simple, yet effective contact form template with indicators for the field labels, field validation and a minimalist design. Contact form 5 has a nice structure for a contact form and it’s a good fit for blogs or magazine websites. It’s black and white, simple and clean. The fonts used are bold and the overall design is responsive and easy to use even on small screens. 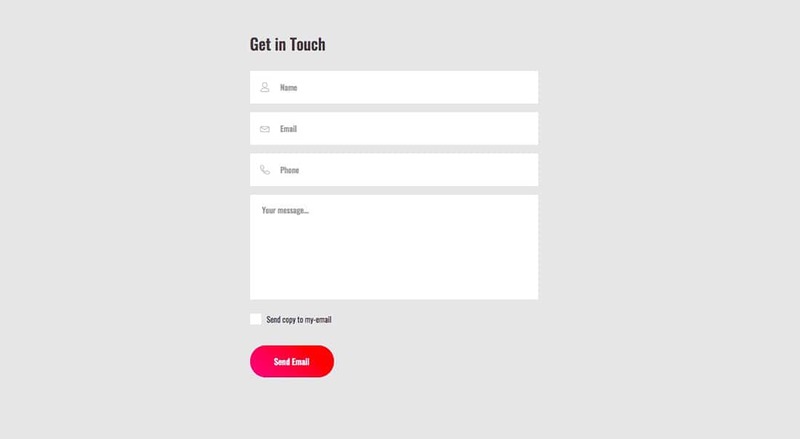 Contact Form 6 is a unique contact form design with a creative layout. The background isn’t static, but instead, it is an interactive map powered by Google Maps. The shadow effects are also interesting. Check it out in action! Contact form 7 has a more corporate style, with a minimalist design and a straight-forward layout. It offers the option of sending the user a copy of the message, by ticking the box at the bottom of the form. This form can even be integrated with an email marketing tool or a CRM system for immediate response. 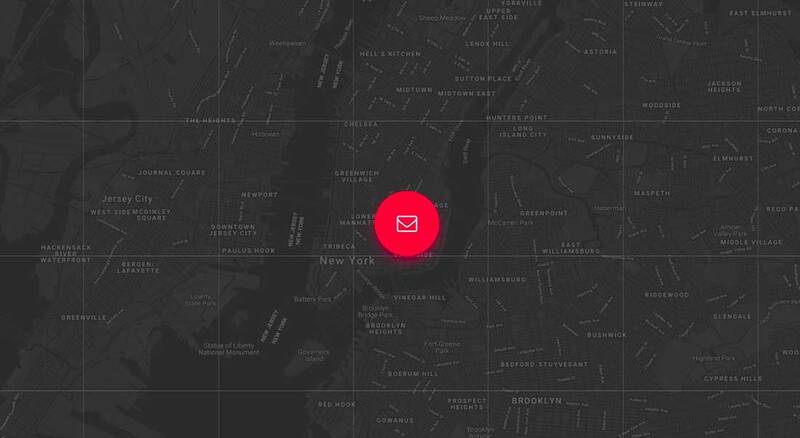 Contact Form 8 is similar to the map form above, but has a cleaner, lighter design. The map in the background is also interactive and powered by Google Maps and the form remains open. There is also the option to send the message as a copy, like in the form above. Contact Form 9 another colorful form, a combination between two of the contact forms mentioned above. The background is an interactive Google Map, but it’s covered by a beautiful neon gradient. The message form is simple, with just three fields, and with subtle shadow effects. 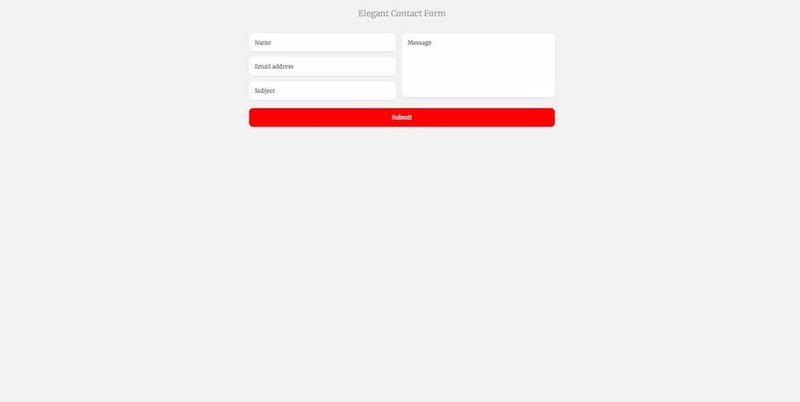 Contact Form 10 is a simple and modern contact form template that you can install on your website for free. This flexible HTML & CSS contact form is easy to customize, so you can add new fields if you need to. 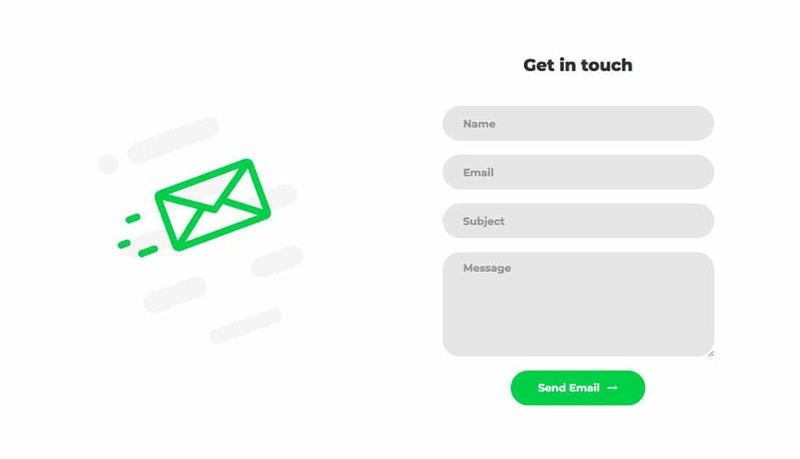 Contact Form 11 has a bold design with bright colors and beautiful vector illustrations. The background is purple, but the colors can be easily changed with some CSS tweaking. The texts can be seen clearly even from mobile devices. 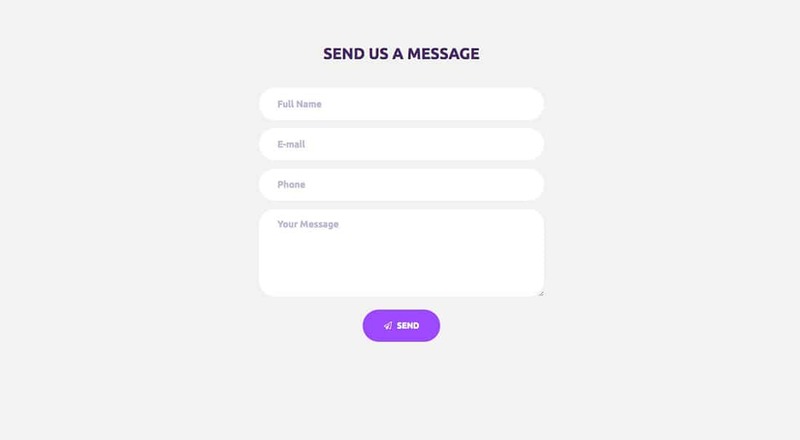 This contact form was created with the help of Bootstrap by designer Shuvo Habib. It’s clean, simple, and full-width. It has all the basic info you would need from the users. 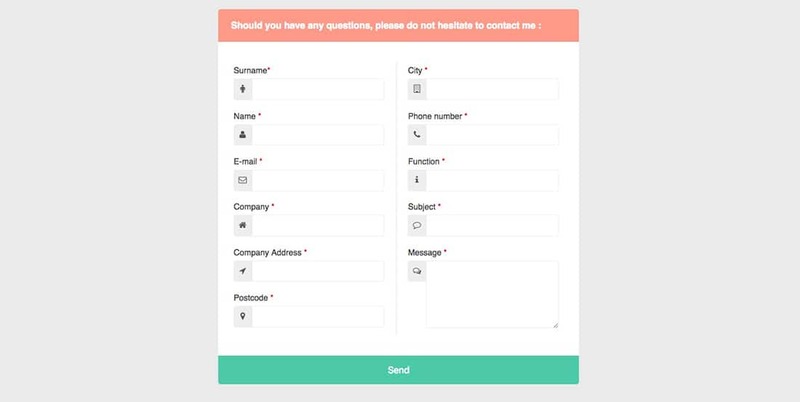 This responsive contact form template was designed by Lisa Wagner. It is mobile-optimized, has a dark layout and perfect for support sections on your website. The colors can be easily modified with some CSS tweaks. 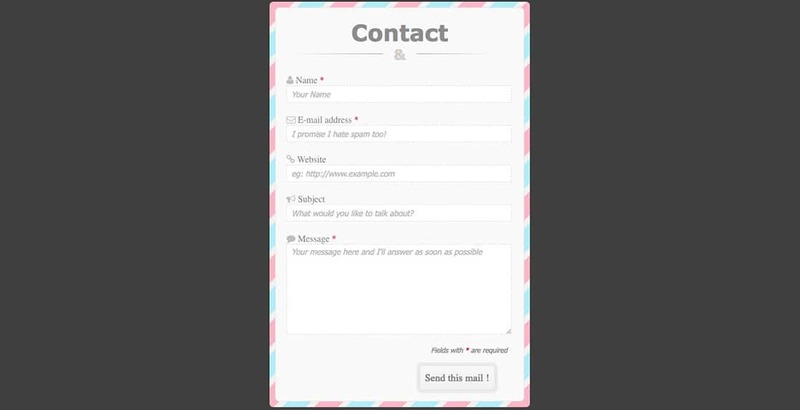 This CSS3 contact form was created by Hong Liu and it is entirely responsive. It also has a great colorful border, which gives it a retro vibe. It’s perfect for any website with a light color palette. 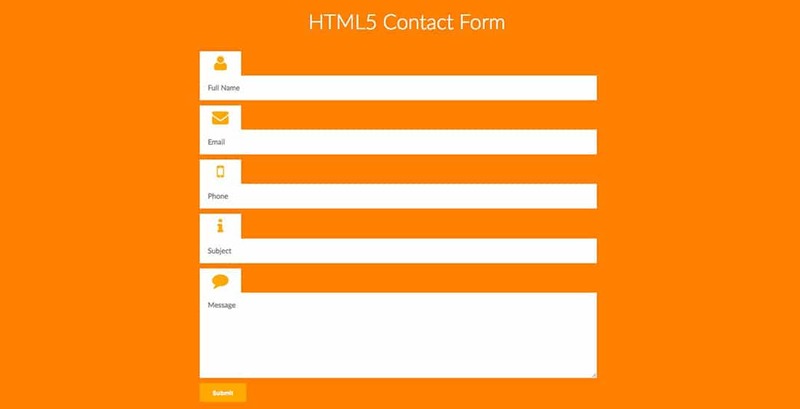 Here’s another HTML5 full-width contact form . The design has an interesting approach for each field’s labels. The colors may be too bright, but this can be easily changed with some CSS modifications. As the name states, this is a minimalist form, with a clean, ultra-simple design. 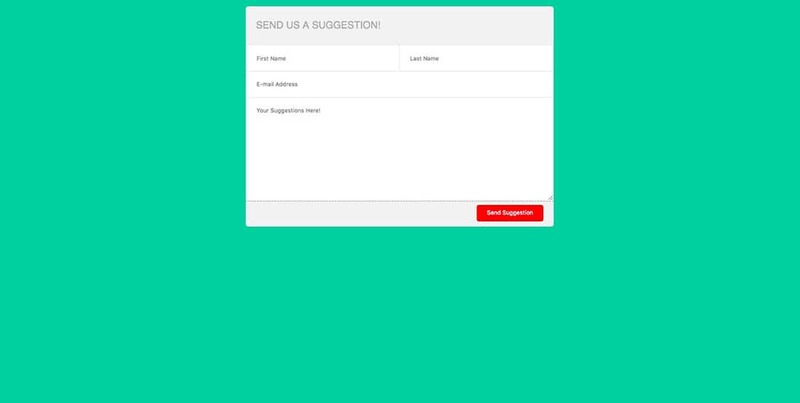 This form design was created by Matheus Marsiglio and contains only three basic fields – for email, name and message. 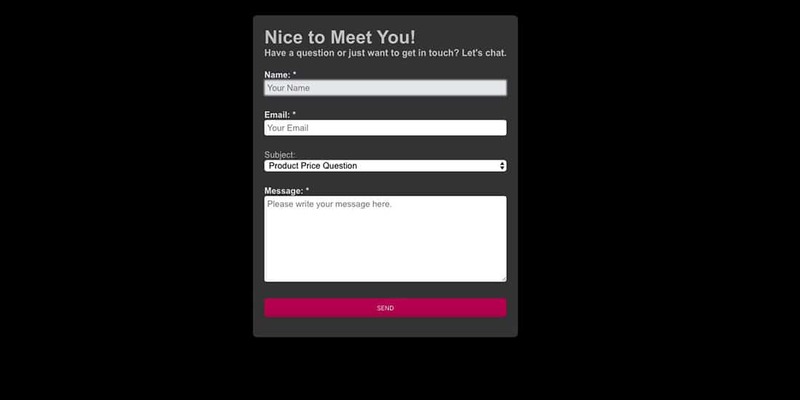 Pen a Day contact form is a lightweight design perfect for feedback forms on websites. The layout is clean and basic and has every field needed for a suggestion box. Do you need an appointment contact form? This template is for you! 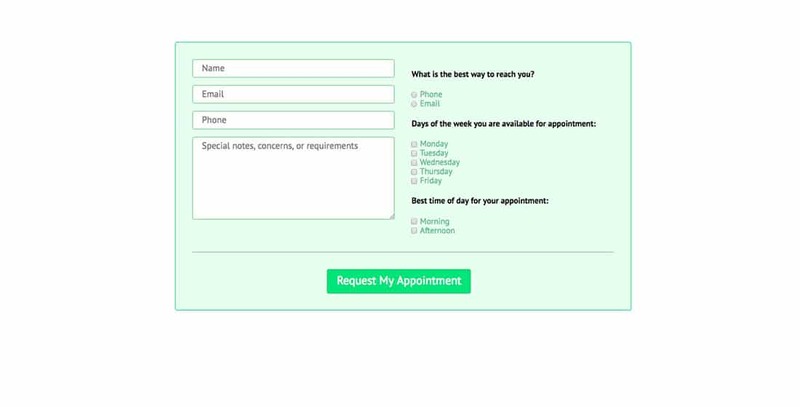 Created by Andrew Wright, this modern CSS3 and HTML5 contact form gives you the possibility to easily manage appointments and book clients for your business! There’s even a feature that lets users specify the best time for reaching out. 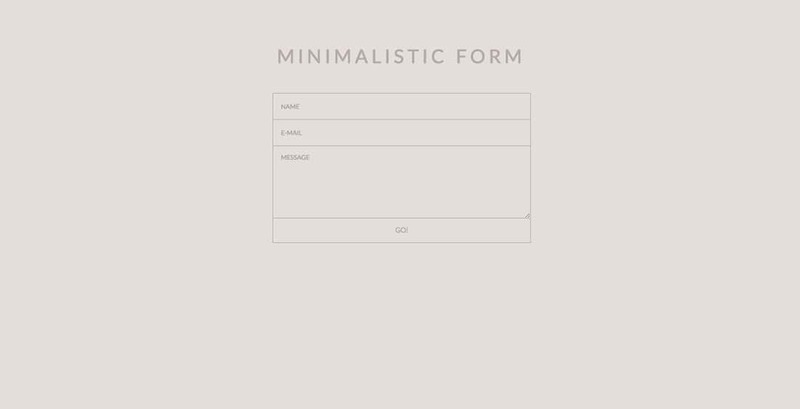 This quick and easy to use minimal contact form was created by Erin Masson. It has an interactive design for filling in the contact details. It can be easily adapted to any website’s color palette. Just as its name states, this contact form template has a pleasing design. Developed by Grandvincent Marion, this well-crafted contact form lets you collect a lot of info about your potential customers/clients through detailed fields arranged in a boxed layout. 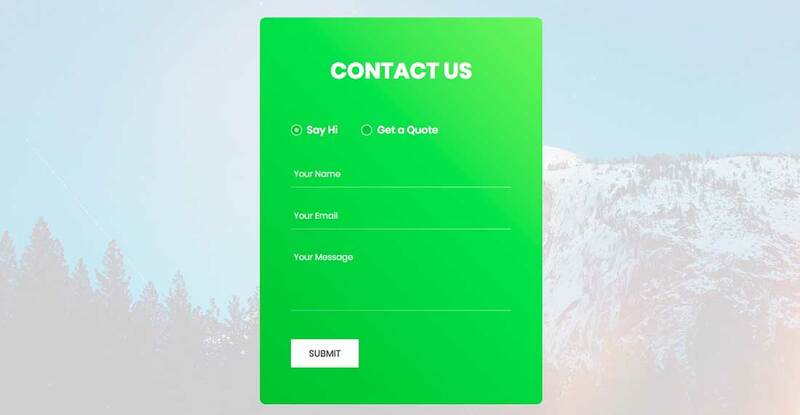 This pretty free contact form template is paired with a large image on the left side of the page. It has the basic fields for a contact form and a simple design. Plus, at the bottom of the form are some neatly-arranged social media icons. 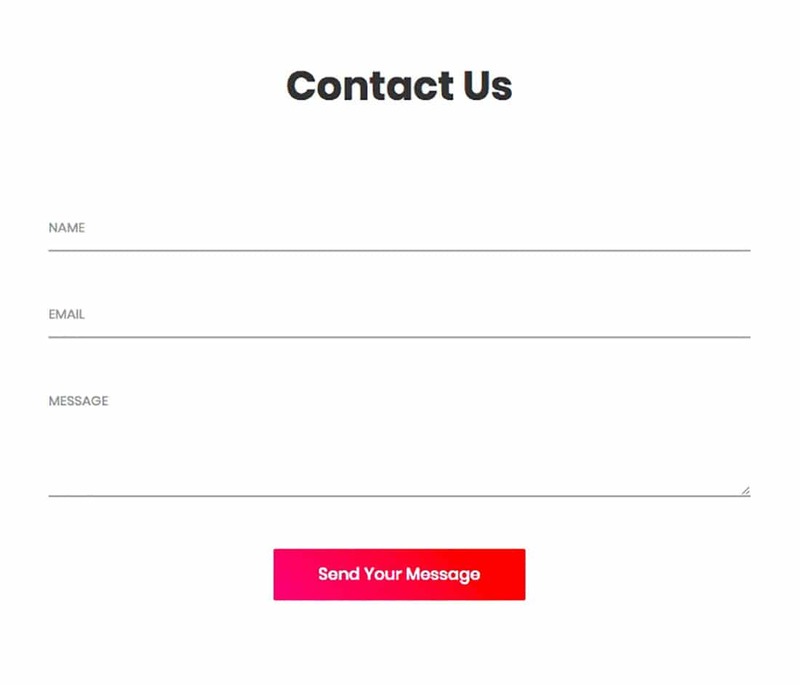 This elegant contact form created by Mark Murray, uses the Compass framework. This modern design can be easily adapted to any CMS your website is using. Give it a try! 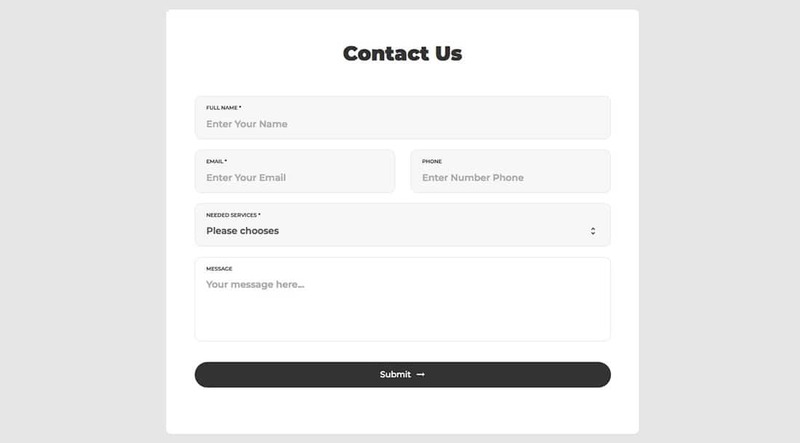 This clean contact form template was designed by Nick Haskell and also uses the Compass framework. 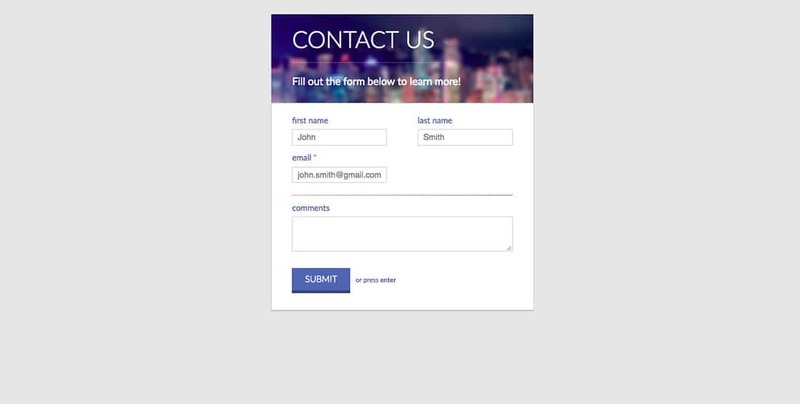 Unlike other free contact forms from this list, this template uses a background image at the top of the form. Its design is visually appealing and professional.